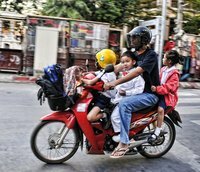 In a nationwide survey sponsored by the World Bank, road trauma was second only to earning a living as a priority by Vietnamese people. Preventative strategies, including compulsory wearing of helmets and drink driving legislation have been effective - though the legislation is not enforced. Stabilisation and urgent treatment of victims reduces fatalities from serious traffic accidents and disasters, particularly in circumstances with limited medical equipment. 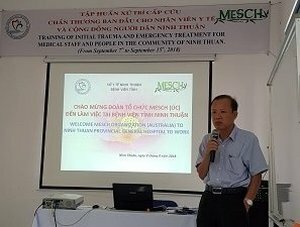 Acknowledging there was inadequate clinical trauma training for frontline staff, Dr Phien (director Ninh Thuan general hospital - NTGH) invited us to work with them to develop a trauma course appropriate for their resource poor environment. This was September 2017. Our principal roles have been in mentoring, arbitration of clinical decisions and, initially, to give “western” credibility to the course. We all agreed to maintain local ownership from the outset. these courses could be run in the South and in a regional rather than a major city hospital. 3) Find local solutions for early deaths and morbidity following major and minor trauma in Ninh Thuan province. It is critically important to thank, encourage and support the new lecturers and interpreters. These courses require considerable time, mental input and loss of income for everyone involved. The slide sets with associated videos that were used in Lam Dong hospital were modified as a result of SKYPE and face-to-face discussion with the local lecturers. This provided the added benefit of education in content and style. A locally produced training video on airway management was added as a result of the video teaching session in the instructors' course 2018. More locally produced videos of “how to” are anticipated. Practical sessions have been extended with a focus on airway management throughout the course. The 2018 addition of a "discussion group" session early in the course resulted in more effective and earlier interraction amongst the group. 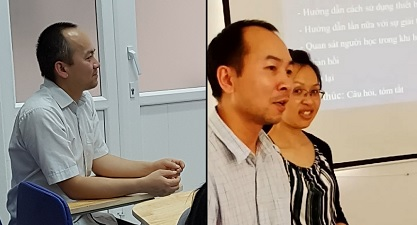 The course ran for 2.5 days and was delivered by Vietnamese doctors with Australian input for the skills and scenarios sessions.There were 15 attendees (doctors and nurses) at the PTC course in 2018 - coming from various hospitals and medical centres in Ninh Thuan province. An instructor ("train-the-trainer") course of 1.5days duration followed the PTC. 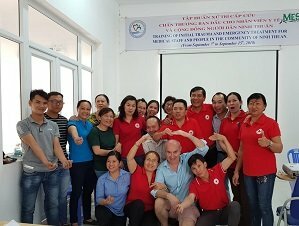 Unfortunately, not all the attendees (10) had attended the PTC..
A 1 day community first aid course (along with its own 1 day "train-the-trainer" course) was delivered by Cuong, Au and Bao Khue - largely to Red Cross members (20). As no govermnet organisation sees itself as having repsonsibility ofr community health education, there is no immediate future in this course. Although the executive management staff at NTGH suggetsed that smaller medical centres might dleiver it to their communities, there is no actual requirement fo rthem to do so. 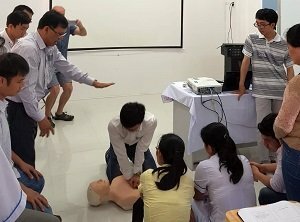 Having regard to the track record of previous PTC courses in Vietnam, particularly Lam Dong and the national hospital in HaNoi, what was achieved in this first year was very encouraging. It is a great initiative by Ninh Thuan Hospital with a very positive future. The broad aims described above were subdivided into more specific and, at this point, achievable ones described in the table below. * Attempt at getting Vn language version of a free interactive (team building) game called “Spaceteam”. Positive replies from developer. Need volunteers with bi-lingual fluency. Communication: The practical sessions and scenarios in PTC will be shared with Australians until they have enough trained staff and confidence to feel comfortable. Attendees come from institutions with markedly different capabilities and backgrounds. Exchange of ideas and understanding the capacities and needs of the participants’ individual hospitals will take time. An interesting finding (noted also in Lam Dong) is that, after the course, 25% of participants felt they needed less equipment and more training. This new style of course delivery is rewarding with strong uptake by all participants. 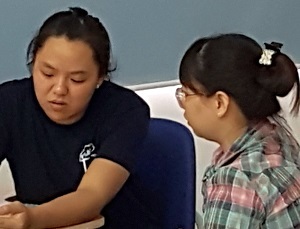 Some of the difficulties we all (Vietnamese and Australian) experience with participant interaction, engagement and learning are a consequence of participants’ unmet and unknown expectations. Some may improve with insights by participants over time (perception) and some will always be insoluble. Transition from Australian input to completely Vietnamese is proceeding well. The inability to positively expand into community first aid at this time is unfortunate and we will continue to explore options. the community – trusting and using the hospitals more improves income, results in a lower probability of litigation for bad outcomes and less likelihood of abuse and threatening behaviours to staff. This is aligned with new funding arrangements due to commence late 2107. Evaluation of these and the ability of other hospitals/ medical centres to assess and deal with serious trauma requires a joint decision by provincial health and MESCH. We would like to continue to assist in making these communities safer and lessen the financial and social burdens of trauma. What do we need to advance this? 2) Bi-lingual volunteers interested in developing a Vn language version of the free interactive game, “Spaceteam”. We want to use this in team building. We have had encouraging and positive replies from the developer. 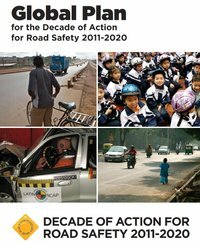 WHO have set a target for reducing death and injury following trauma by 50% by 2020. The courses in LDGH and NTGH are part of improving outcomes after trauma. An ideal opportunity exists to make a huge change in outcomes of trauma across the provinces. Some funding for this could be sought at national level. We have no influence in this.